Attending Education Reimagined Symposium: Furthering Learner-Centered Education – Suzanne Freeman, Ph.D. 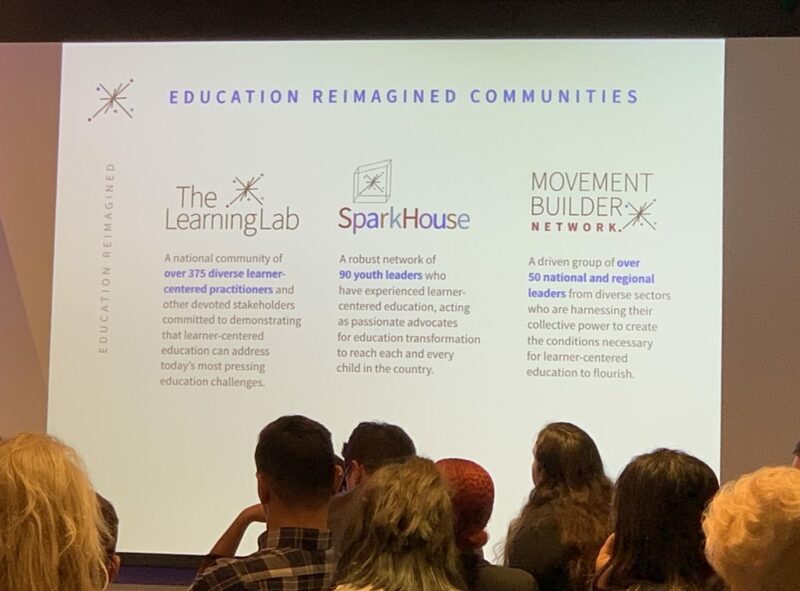 I had the pleasure of being part of Education Reimagined’s Symposium in Washington, D.C. on January 17, 2019. It was a day of learning, connecting, committing and celebrating! When I was Superintendent of Pike Road Schools, a few of our staff members heard Stephan Turnipseed speak at Auburn University at Montgomery. They were stunned by how he spoke “our language”. I remember them sharing about how others in attendance continued to look at them and say, “This is what you guys are trying to do in Pike Road.” We were striving to create a school system in which learning is authentic and meaningful to children. Our Mission was to create a culture of intellectual curiosity where all students have ownership over their learning and are inspired to think, innovate, and create. 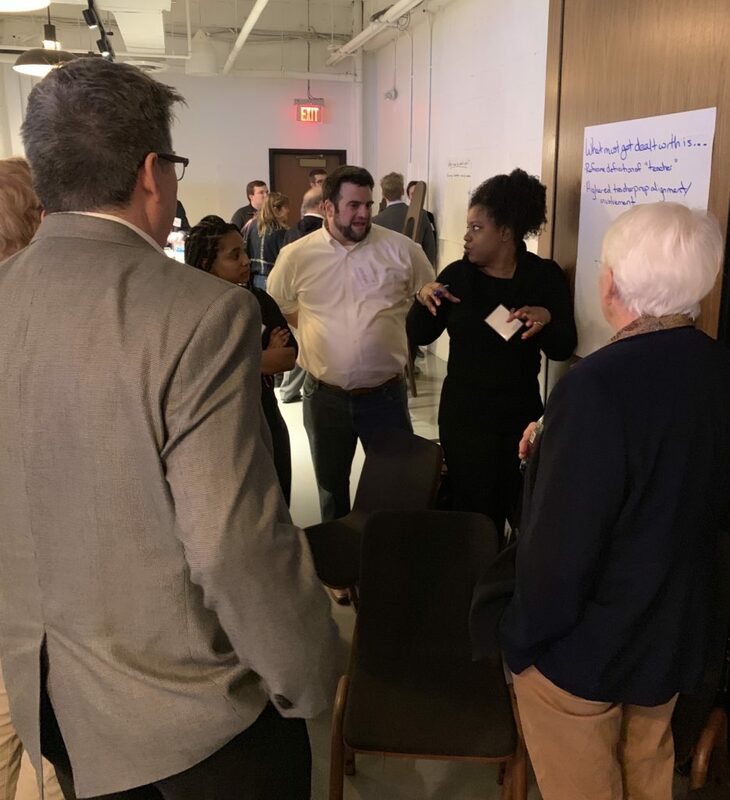 Even though we had conducted eleven neighborhood/community meetings to build capacity for The Pike Road Way, we were experiencing many challenges with space, limited resources, and pushback from some parents because our approach was so different to what they were accustomed. Stephan Turnipseed is a national voice on education reform by advocating for hands-on learning. He visited our school and suddenly gave us credibility for pushing the boundaries of what school can be for learners. The timing could not have been better! 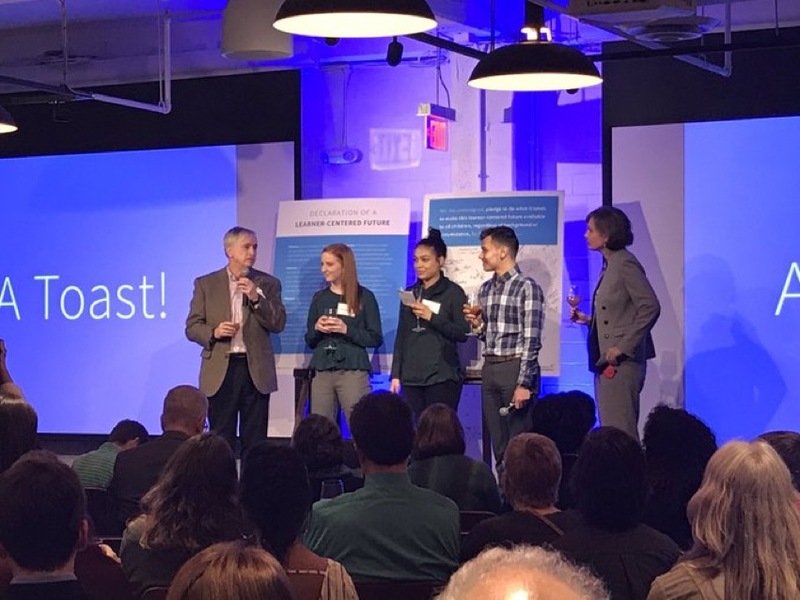 Stephan connected us with Education Reimagined and several of us attended The Pioneer Lab (now The Learning Lab) in Atlanta in 2016. Through Education Reimagined, we became part of a movement to transform schools into student-centered environments. Participating in the Learning Lab enabled us to network with others doing this work, speak a common language by reading A Practitioner’s Lexicon-Learner-Center Education and go deeper in our understanding of each component, which when fully present creates a learner-centered environment. 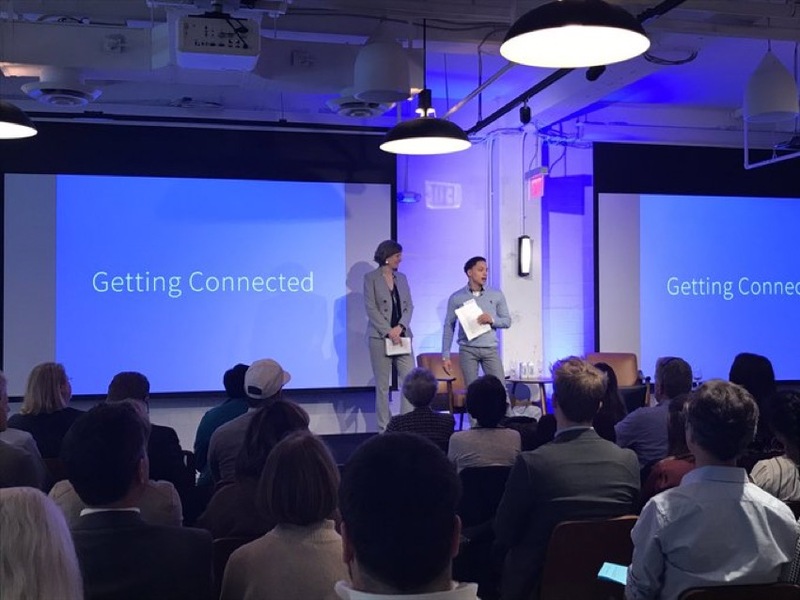 The room was filled with over 200 passionate and committed people who came together to celebrate how learner-centered education has already impacted the lives of many young people and to pledge our commitment for all young people to experience learner-centered education. There were many speakers, but I want to highlight just a few below. The symposium was kicked off by Gisele Huff and Becky Pringle. Gisele Huff is the Executive Director of the Jaquelin Hume Foundation in San Francisco and serves on numerous boards promoting innovation in education. Becky Pringle is a middle school science teacher, a social justice advocate, and Vice-President of National Education Association. Their paths intersected when they became part of a group of 28 education stakeholders to create A Transformational Vision for Education. Both are staunch advocates for learner-centered education for all young people. These two leaders set the tone for the day with their inspiring words. Kelly Young, President of Education Reimagined and Jemar Lee, a Fellow with Education Reimagined and an alumni of Iowa BIG asked everyone to form small groups and get connected by sharing their responses to, “Why did you accept the invitation to come to this Symposium on learner-centered education?” and “What matters to you about that?” This was an opportunity for those in the room (teachers, student learners, policy makers, business leaders, advocates, etc.) to get connected with other like-minded people. Ulcca Joshi Hansen facilitated a conversation with Todd Rose, who is the author of The End of Average and Dark Horse. Todd reminded us that every field is shifting to more personalization and education is too. Hence, we must create systems that provide diverse pathways which support young people to reach their full potential. One of my favorite quotes from this segment was from Ulcca when she was referencing open-walled, “The world becomes a playground for learning.” I like the image this creates as we shift to a 24/7 learning mindset. Carlos Moreno, Co-Executive Director of Big Picture Learning kicked off this portion of the symposium. He shared about his personal experiences at Fordham University in which he was robbed and yet never received support through this tragic event. He compared this to what many students experience and how they go through school without the emotional support they need to manage challenging life circumstances. Carlos shared about their learner-centered approach at Big Picture Learning. The most impactful part of the day was hearing directly from learners. Their powerful stories brought to life the importance of learner-centered education. Megan Matson, a learner at Iowa BIG, shared about how she works on projects she is passionate about. She spends half of the day in school and half in her community. She explained that the transition to a learner-centered school was tough for her. She was accustomed to teachers handing out worksheets and giving tests. She went on to say she never learned how to work and learn on her own in her previous school. 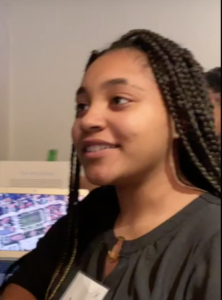 She described that a few weeks into school (Iowa BIG), she was part of a project in which she interviewed people on the street, then wrote and podcasted their stories. From this experience, she learned she liked to talk with people. She is working on a new project in which she and others are hosting professional development days for traditional teachers. Through this project, she is working with business leaders and acting as their student voice. In addition, she is talking with local colleges and universities about how to transition learning in their environment to real-world experiences. She is also talking with Harvard University about their scholarship and application process. Meet Olivia who is an Alumni from Iowa BIG in Cedar Rapids, IA. Click here to listen to her story. 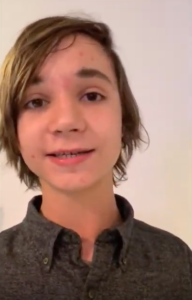 Meet Alonzo from Springhouse Community School in Floyd, VA. Click here to listen to his story. 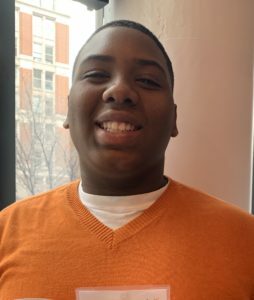 Meet Tenaj from Camden Big Picture Learning Academy in Camden, NJ. Click here to listen to his story. 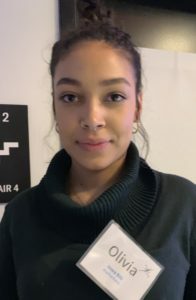 Meet Ashanti from The Met School in Providence, RI. Click here to listen to her story. 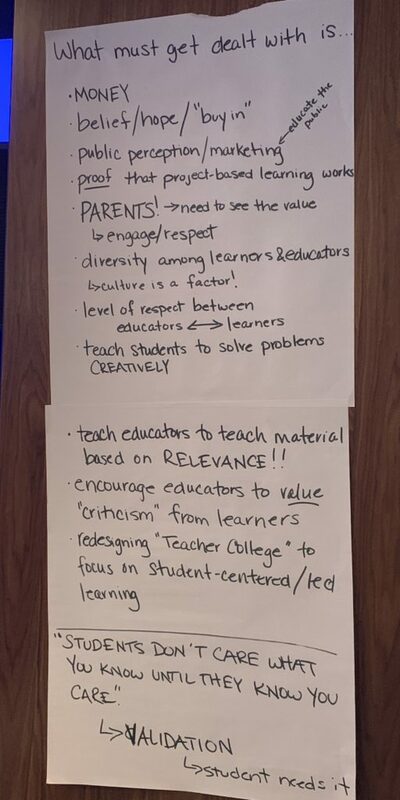 We worked in small groups and listed What must be dealt with to make learner-centered a reality for all children in our country. When I participated in the gallery walk to review each group’s work, the commonalities were evident. 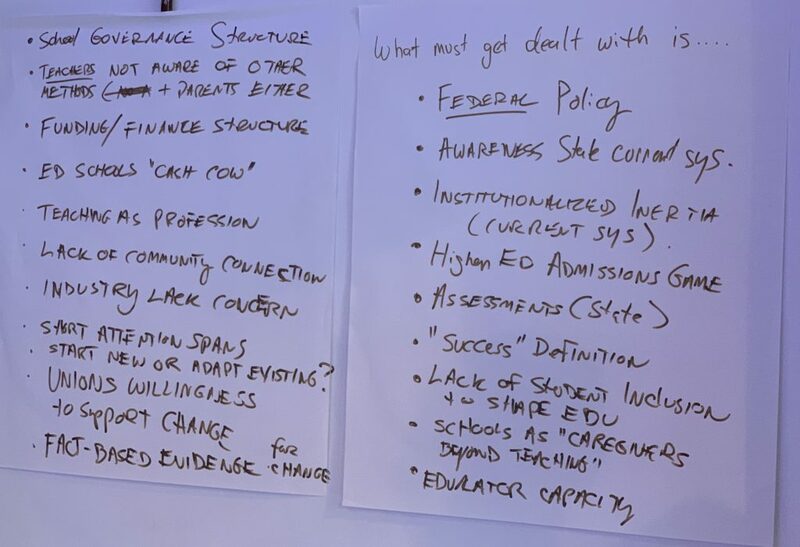 Then each person wrote down the year we believed experiencing a learner-center education would be a reality for ALL children. I had never contemplated that question until that day. After a group discussion, the consensus was 2030-2035. In other words, we believe all children in our country will experience a learner-centered environment in 11 to 16 years. We have work to do to make this a reality! Kelly also shared three Important Movement Efforts and how each one of us can use our influence to have a broader impact through the Year of Learning. 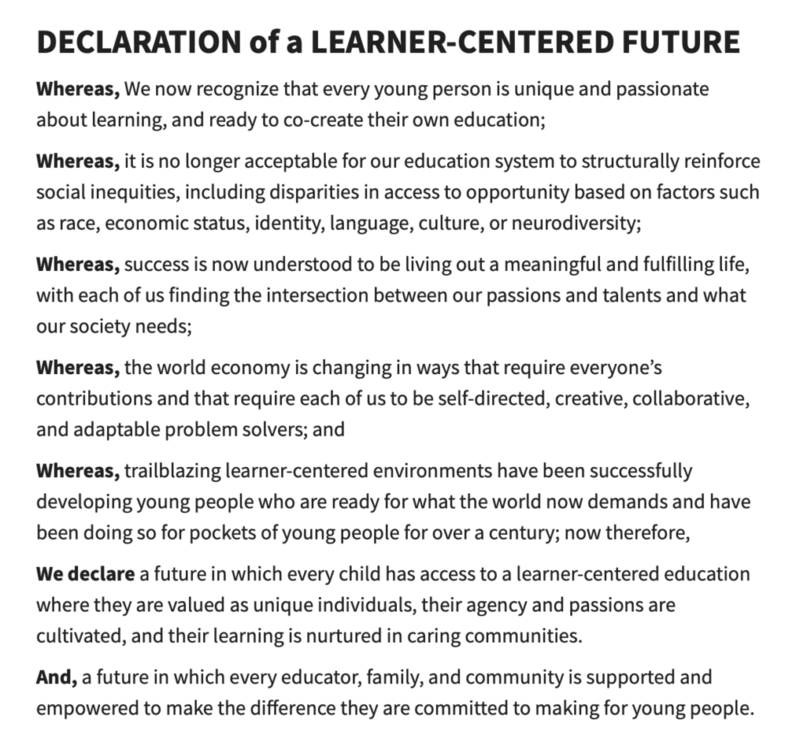 This was a time for those present to make a Declaration of a Learner-Centered Future. Each participant read the declaration and those who are committed to this work signed it. Robert Fersh, President and Founder of Convergence, Megan Matson, a learner from Iowa Big, Olivia Christensen, an Iowa Big Alumni and Education Reimagined Board Member, Angel Velez, a learner at Camden Big Picture Learning Academy, and Kelly Young, President of Education Reimagined concluded the day by each making a toast as we all held up a glass of sparkling cider. 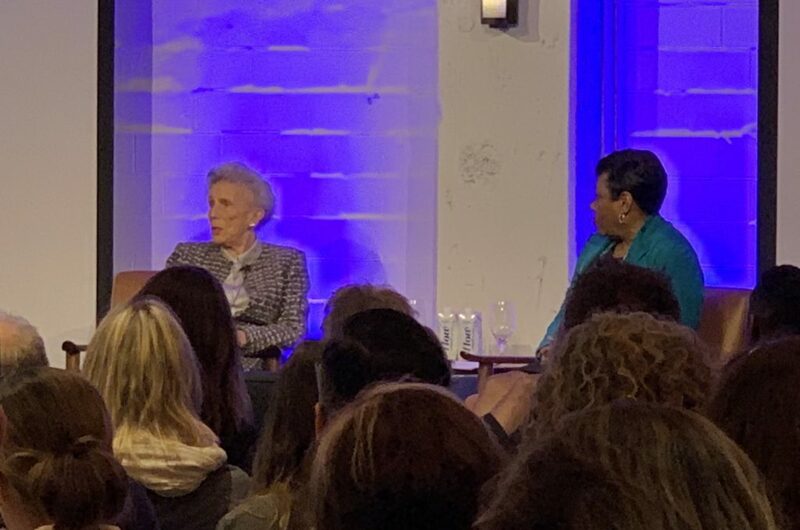 Kelly thanked Convergence for launching Education Reimagined and all those who are courageously working to make student-centered education a reality for all children in our country. Why does this matter to me and what is my role in furthering learner-centered education? 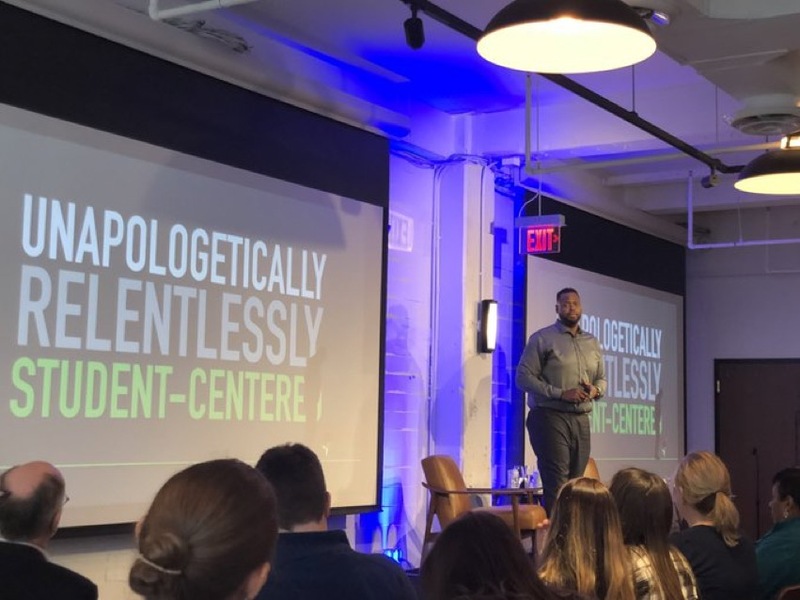 This was a celebratory day of reuniting with friends from across the country who are working tirelessly to create learner-centered environments. I also met new friends who want to get involved in this work. 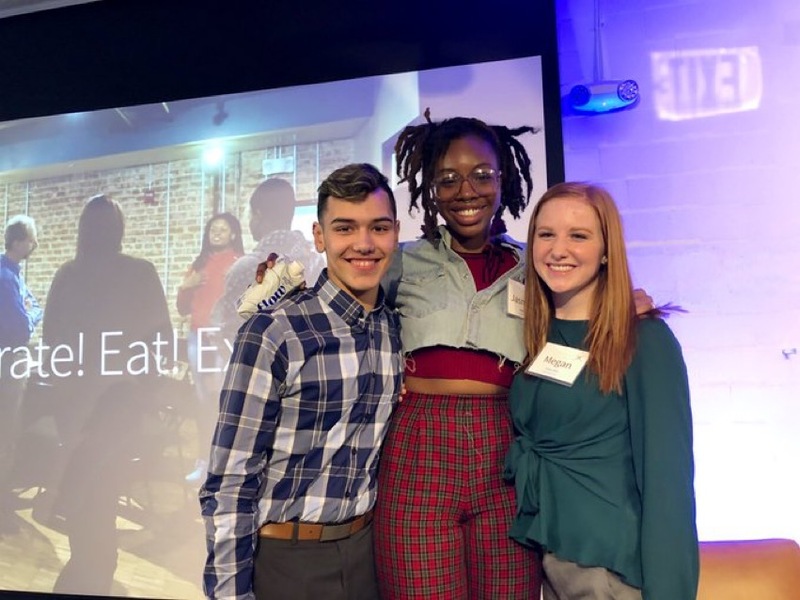 At each Education Reimagined event, I network and experience powerful learning with others and this event was no different. Creating learner-centered schools/environments is hard and work. We need to learn from and support others doing this work. I believe every human being has unique talents and interests. I believe every human being should have opportunities to learn and develop these gifts and interests – – to find their passion. I believe we need to change schools to accommodate the needs and interests of learners and not force learners to adapt to an outdated school model. Don’t we want all people to experience joy, happiness, fulfillment and a lifetime of learning? I do and will continue partnering with others as an education consultant, a blogger, an influencer, and an active member of the Education Reimagined community to use my influence to make this a reality for all young people. If this work resonates with you, I invite you to join the movement and share your gifts and influence to make this a reality for ALL children! 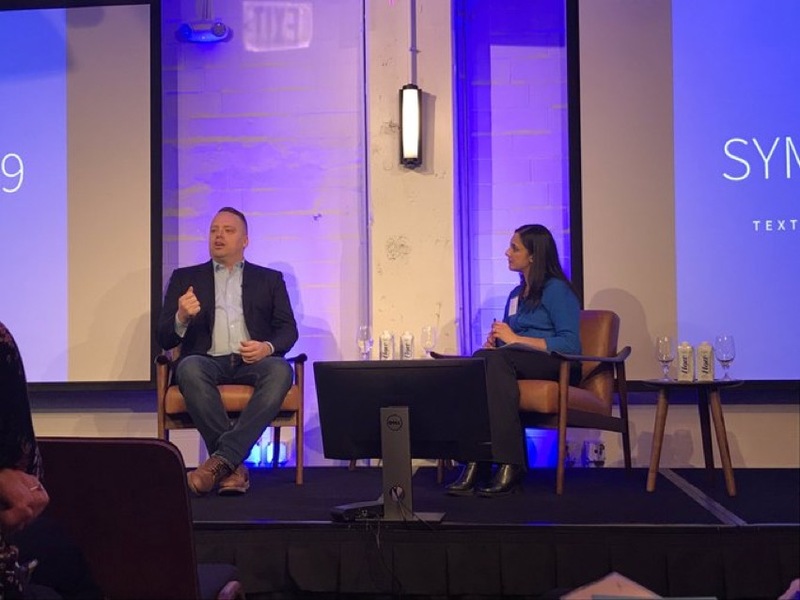 A Transformational Vision for Education in the US: This is a learner-centered vision, which is the foundation for Education Reimagined’s work. I am sad I missed this! 😕 Thanks for taking the time to recap the symposium for those who could not attend. The quotes are powerful. Every time I read your blog, I wish my three children (now adults) could have been students under your leadership. I am grateful you are sharing your wisdom. The students in the videos are knowledgeable. When students can talk about their learning, I know they own their learning. I am a grandmother and this way of learning is what I want for my grandchildren. Thank you for sharing. I will share about this organization with my daughter so she can share with my grandchildren’s school. Copyright © 2019 Suzanne Freeman, Ph.D.